The 5th Capoeira Festival will take place in San Pancho, the Cultural Capital of the Riviera Nayarit from April 7-10, 2016. This year the guests of honor are mestres Paulinho Velho and Everson from Brazil, and Marcia Cigarra, from Mexico. 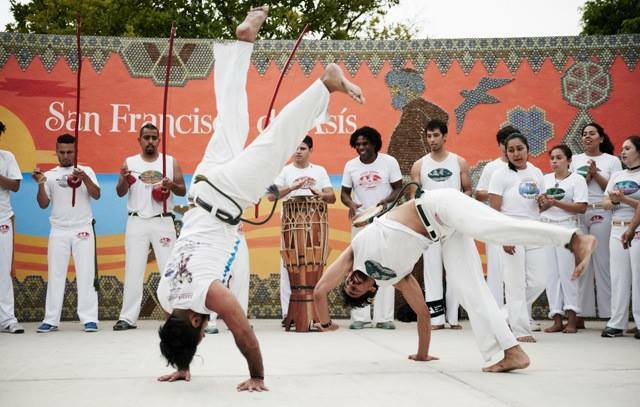 This capoeira martial arts cultural encounter will be held at the Bodega del Circo de Los Niños, the Bodega Teatro and the Entre Amigos sports area, where they will hold simultaneous classes and workshops for all levels including beginner, intermediate and advanced. “I think the cultural change in the town has been monumental. San Pancho is more welcoming than ever, it’s more polite, more open to other disciplines and other art forms. There’s a lot more participation from parents and children who are demonstrating an interest in new things beyond the usual day-to-day stuff,” said Joel Carrizo, a native of San Pancho and director of the Escuela Abadá Capoeira Nayarit. Carrizo is also on the organizing committee. Approximately 100 athletes are expected to participate, 40 of which are local with the remaining 60 traveling in from other cities in Mexico. Activities will be held nearly all day long intended to perfect techniques and allow for interaction among the participants, including acrobatics, music, singing, dinners, talks and everything that encompasses this discipline. Among the standout activities is a walk towards the Plaza del Sol on Saturday afternoon, where a general roda will be held. One of the main events takes place on Sunday morning at the Bodega Circo: the graduation ceremony, known as the Batizada y Troca de Cordas, held not only for those who are new to capoeira but also for those who are moving on to the next level. Access to the viewing public is free from start to finish; those who already practice the sport and want to participate can do so by registering. This is also a fantastic opportunity for those who have never tried capoeira and are interested in beginning their training, as they are currently accepting children starting at three-and-a-half years of age. For more information please visit: https://www.facebook.com/abadanayarit/?ref=ts&fref=ts.